Although the Arabic speaking community in Second Life is quite large, Second Life is still not capable of “understanding” Arabic. It does display Arabic letters but they are not connected so that it it almost impossible to read. The community has campaigned a lot for this feature to be implemented but to no avail. So, most have resorted to writing Arabic based on a mixture of Latin letters and some numbers that represented those Arabic letters that are not in the Latin alphabet. paste this text into the Second Life text chat window or a notecard. Of course, this is not an ideal solution for live conversations, but it’s great for Arabic language lessons and for notecards when one has time to prepare the text in advance. As I mentioned in part 1 of the recording video blog posts, I have only recently started recording in Second Life. It had never crossed my mind that I might need to worry about copyright when making recording in SL. I had simply not thought this might be something to have to consider. I was made aware of this when I came across a video tutorial about copyright by David Miller, who had left a comment on my part 1 recording post. “The permission questions is a good one. I made machinima in Second Life (http://blip.tv/file/835879) and I had the same problem. For legal reasons, you usually have to ask creators of buildings, clothing or attachments if you may use it in the movie. I think for school it’s not as important as for the movie (since you don’t publish it worldwide). I personally would just ask the owner of the place. In most cases they will be delighted if you like their place for a class. I would also check if a place will be used by other people on a regular schedule. For example, most SL schools are open for everybody to use their sandboxes and classrooms, as long as your class don’t clash with one of their scheduled classes. “Yes Nergitz, that’s right. You won’t ask in real live if you have a desk, a chair or a suit in your picture or movie. But it’s different if you see the label “Armani” on the suit or if there is a bottle “Pepsi” somewhere in the picture. You definitely would better get permission to use these brands if you want to publish photos or videos showing these brands. In SL, you usually don’t ask for every desk or chair, as long as it is nothing special. But if you do a scene in a fancy castle for example, and the creator of this castle will recognize it in your photo/video, they may be able to sue you because you used their creation to create a work on your own and you publish it. It’s even worse if there is a brand name on the object. For example if you buy Nike shoes in world, you cannot be sure the creator has Nike’s permission to sell their brand in SL. So if they will see your photo or video, they will first come after you because you used their brand in a photo/video without written permission. For me as a director and producer, this was the hardest part in machinima to get all these permissions, because I needed to get them in writing. Technically, I should have sent out papers to sign, but I just used notecards and kept the returning notecards so that I had a proof that I’ve got permission. After the first movie, we decided to use only material that we created ourselves because it’s sometimes too difficult to contact the creators. This usually is not so important if your photos/videos will be viewed in a small community like in your classroom. But if your video becomes famous on youTube for example, you can face the risk of a very expensive lawsuit if you overlook something. This makes perfect sense and is not that different from RL then. I can imagine how much work it must have been to find and get permissions from all the creators (or blur the brand names). I’m not intending to make machinima myself (although there is such a project at the school I occasionally teach) but I have started making tutorials. So i’ll keep these things in mind. Another related issue is asking for permission when recording students, trainees or anybody else who happens to be around when recording, like I did in the first recording here . Again, this is similar to real life and permission has to be asked before recording and especially before publishing them. I also try to remember to hide avatar names that normally show above each of them but it is still often possible to recognize who they are and it is safer to ask for permission. Through a comment by David Miller on my blog about recording videos in SL, I came to this blog with a video tutorial about how to make animations for SL. My first reaction when watching it was “Why is there no sound?” I even checked my sound settings on my computer to make sure volume wasn’t turned down. I had a strange feeling that something was missing and “craved” to hear the person making the tutorial speak to me. Only when I read David Miller’s comment on that blog, did I realize that what I considered as lacking was actually something that made this tutorial more accessible for others like the deaf or maybe even speakers of other languages. I suddenly realized that, even though we have the tools and possibilities to make things more accessible we don’t always do it. Often this is not because we wouldn’t want to but because we are not always aware that we are settings barriers. Thinking about these issues makes me realize how wonderful environments like Second Life and other virtual worlds are for people with different abilities. In most cases you can choose whether you want to communicate in voice or in text or a combination of both. In addition to text and/or voice, you also have the visual 3D environment itself to help get across meaning. This makes it much more accessible than a 2D virtual class- or conference room, except of course, where sign language is used and it is important to see the real person via a web cam. These are just some quick thoughts that came to my mind when watching the “silent” tutorial video. There is a lot more that one can say about accessibility and virtual worlds. What do you think about accessibility of virtual worlds and/or tutorial material? It is important to know which possibilities exists and when to use them whether you hold staff meetings in SL, do training or give lessons. In order to be able to easily communicate with others, it is good (and sometimes necessary) to befriend them first so that they are in your friends list. It is also possible to IM (instant message) or call avatars who are not in your friends list by searching for them but there are limitations when it comes to group chat as an example. Here is a series of video tutorials on the different ways that avatars can communicate in Second Life. I know there are already many Second Life video tutorials but often they don’t show exactly what I want, so I have started to create my own. I have created these for a teacher training course which I am doing at the moment. I usually don’t use a script when doing these tutorials, so you might here the occasional “er” and other mistakes. Live with it! 🙂 I am not going to record them again so soon. You can buy the Sky Tables online here or in the in-world shop. Analysing hands-on workshops using an analysis grid and coming up with a list of key factors for the design and delivery of successful SL workshops. My personal list is here. Peer-evaluation of the workshops using an observation form based on the key factors that came up in activity 1. Writing an analytical “story” of our experience with our workshop using the STARR template for storytelling which was provided. Constructive feedback from peers can help tremendously in helping a teacher to improve their teaching practise. Peer observation and evaluation can be rewarding for both sides, the observer and the teacher being observed. Having read most evaluations, in this workshop activity peer observation did not work well in my opinion. One reason might be that the observation form had not yet been complete before some of the observations started. Another reason, I suspect, was that peer feedback was “public” and could be viewed by all course participants and coordinators. This might have been a dilemma for some who might not have wanted to be critical openly. 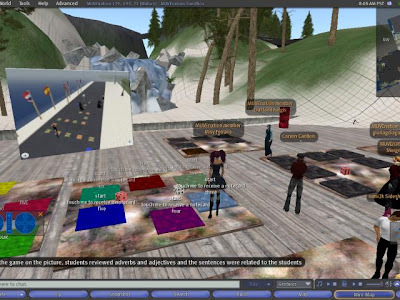 Additionally, as many of the participants are still very new to SL and this was the first workshop they had conducted in a virtual world, peers wanted to be encouraging. This is perfectly fine but for feedback to be developmental, there should also be suggestions for improvement. As a result, I think peer observation and giving constructive feedback is a skill that needs to be practised. Also, as trust is an important factor in peer evaluation, these should not be made public. Instead, in a course, where all could benefit from reading about others’ evaluations, participants could be asked to collect main points they observed together with suggestions for improvement in a separate place without names, kind of like a teacher who gives general class feedback at the end with relevant points that they observed while monitoring a class activity. A beginner Second Life builder trying her hand at giving a hands-on building workshop. What was the setting in which this case study occurred? After having observed and analysed hands-on workshops, we had to plan and deliver our own. It was difficult for me to think about a topic for my workshop. I had thought about and discarded several ideas due to time, space or other constraints. My building and scripting skills are limited but I decided I could manage a beginner building workshop. I knew I wanted it to be useful to my peers and fun. What was the problem to be solved, or the intended effect? To plan and deliver a workshop for beginners to build a simple interactive board game within a time limit of 60 minutes. The number of participants was limited by the number of building spaces provided to a maximum of 12. What was done to fulfil the task? When I had decided on building a board game, I first wanted it to be a collaborative building task but in the end I didn’t dare to do it. I was not sure I could handle all the problems with permissions that might come up, especially with beginners. So, I decided every participant would have their own building space which would be their game board. This meant that there was not enough space nor time for everybody to build a complete game that we could play together at the end but it would be enough to demonstrate the skills and the concept. Preparation: I prepared 12 boards/building spaces for participants. This meant some of them would be out of normal chat range. I modified my SpeakEasy HUD script to make it shout the instructions (suggested by a friend) but we would also communicate and needed a save means for this. Not everybody knows how to shout. I thought of putting up a sign but participants might forget to and by habit simply hit the enter key. A friend came up with the idea of chat relay but an experienced workshop tutor said it caused lag. Another friend suggested I use group IM. Why didn’t I think of that? Sometimes, in a stressful situation (and preparing the workshop was stressful for me because I had no time), we forget even what we know. I wanted to announce a demo of my workshop in another group of educators to test it, improve the instructions but again because of lack of time, I could not do that. On the day of the workshop, an experienced friend asked me on Twitter whether I wanted to do a run through. It was only three hours before the actual workshop but I agreed and am so happy I did. As a result, I simplified my instructions, deleted some slides and additional information and most importantly found out and solved some issues with permissions. Another issue that came up in the run-through was that participants would have several windows open at certain times in the workshop (edit window, notecard, group or local chat window) plus needed to look at the slides and back at their objects. I could not avoid any of these but I decided to tell participants this would happen and gave some tips at the beginning (making windows smaller or minimising them when not needed). Multi-tasking for the tutor can be challenging, too. In other lessons I taught in SL, it often happened that I received several IMs from friends who did not know I was teaching, from students who wanted to be teleported (instead of asking peers or finding the LM in their inventory), IMs from students present who preferred to ask a question privately than in local chat plus group notices or IMs from groups I belong to. At the same time having to deliver the lesson, change slides, take notes, chat with students in local chat, etc. can be quite demanding. And I am usually much more exhausted after a SL lesson than a Real Life one. In regular classes, I establish some rules with students (e. .g “send teleport requests to peers not the teacher”, “don’t IM teacher during the lesson except when it is required in a task or absolutely necessary”, for friends: “when I am in busy mode, it really means I am busy and will not reply”. This was not possible really for this workshop because it was a one-off session. Tools can be of great help in delivering lessons but they can be a real pain, too. I rarely use more than two teaching aids or tools in a session. Of course, this depends a bit on the situation. The same goes for the actual topic and the lesson plan. For the workshop, I decided a slide screen, a material giver and (the invisible) SpeakEasy HUD was enough. I had prepared slides of the different steps to avoid having to give long-winded instructions. I used a screen that I had recently be shown by a friend on which you can highlight areas. Very useful indeed! I also printed out the instruction text and crossed off what I had already said with the SpeakEasy HUD. At first there were only the two participants who had also signed up as criticla friends. But then two more came. The session went smoothly and participants could follow the instructions easily. I have to say, however, that several were not beginners. A late-comer started on his own and was able to catch up. One participant had frequent crashes and fell behind. Another participant did something I had not expected and this caused her problems for the later steps. I helped by giving her additional instructions in IM to remedy the situation. I am still not sure what caused this: my instructions, language issues or the participant being distracted by private IMs (which I suspected). Latecomers can cause havoc in a workshop. I did not observe enough workshops in SL to know how experienced tutors deal with them but having planned to deliver my workshop in the MUVEnation sandbox, I knew I could expect latecomers and guests and this was to some extend even welcome. I did say how I would deal with them in my workshop description (observe or take the worshop material and try on your own) but, of course, not all would have read it. Some just popped in to do something in the sandbox, saw that something was going on and started chatting with me: “Long time no see” 🙂 I was determined not to have the flow of the workshop be interrupted too much by these but I didn’t mind observers and I didn’t want to sound unfriendly or unwelcoming. So I said a few words but indicated in local chat that we were going back to the instructions. Surprise guest: At some point, a former SL student of mine suddenly materialised on a participant’s board. He was one of the students who were on the slide that I had shown at the beginning of the workshop showing him and peers playing my first board game. I thought I was dreaming and tried to make sense of it. I know a lot can happen in SL but I started thinking “my showing a slide of him can’t have made him appear in my workshop. Yeah, after being in SL for a longer while, you start believing such weird things can happen 🙂 It turned out that he had been teleported by the participant on whose board he arrived. I had introduced them some time ago and apparently they had developed a friendship. All participants were able to finish their game. Although, none of them had prepared questions in advance (I had asked for this as preparation for the workshop). Nobody seemed willing to spend the time to write all the question notecards but they did write some so we could test the games. When taking their objects (the board with the tiles) into their inventory, they could not take the boards although I had set permissions to copy/mod. I had forgotten to tick one more box and when I did, participant were able to take them. What did you learn from the experience? Don’t expect participants to have read through your announcement and have prepared for it. Be prepared to do shortcuts and don’t force participants to do all the steps if it is not absolutely necessary. Always double-check permissions of your material. Tip 8 – Organise your inventory!!! Organise your inventory very well. This is extremely important. Rename your notecards, objects, Landmarks, etc. so that they make sense to you. Do the same with your educational tools, objects, landmarks, etc. You could also create one folder for your course and then sub-folders for notecards, objects, textures, etc. instead of using the default folders that SL gives you. Fewer questions will arise and thus there will be more time left for the actual activity. Keep your lesson plans flexible! I know this is something we have to do in Real Life, too. It is even more important in SL because more unexpected things happen and there are often technical issues that cost time. In general, you have less control of the class and the environment than in RL. However, this does not mean this is something negative or a disadvantage to RL classes. To the contrary, if you are flexible and keep your lessons flexible and if you are confident enough as a teacher and SL resident, the uncertainties can make the teaching and learning events in SL much more authentic and fun. The outcome might be different from what you had planned but as long as learning takes place and we keep relaxed about not having all the control, everything is just fine. When planning flexibility into your lessons always keep in mind what your main aim(s) or objective(s) for this lesson are. So that when you have to leave out a stage it is not one that was important for the main objective(s). If you don’t think in advance about what you could leave out, shorten or change, what often happens it that there is no time left for the last stages, which might be more important than some of the previous ones. All course participants should be asked to add everybody else including the teacher to their friends list. This is necessary for pair and group work or when students need to be teleported* or teleport others. Also, outside of class, they can keep in touch and practise together or help each other with questions and problems. Create a group for your classes and have all students who are enrolled in this particular class join the group so that you can send group notices about the course, homework reminders, etc. You might forbid students to use this group to send group messages to their peers. You might, however, also allow them to use it in some cases (saying which) so that they can help each other or chat out side class. Do not use this group to add all people who are interested in your classes. You can create a separate group for that purpose. Creating a group in Second Life costs L$100 and at least one other person besides you needs to join the group within 48 hours otherwise the group will be cancelled with no refund and you will not be able to use that name again. Update: Also remember that you can only join 25 group with one avatar. You might, therefore, want to reuse groups with new classes.